The Indiana Department of Transportation announced March 28, 2018 that $161.2 million in federal transportation funding is being awarded to 66 cities, towns, and counties in rural portions of Indiana to invest in local road and bridge improvements as well as sidewalk and trail projects. Combined with local funds, approximately $212 million is being invested in infrastructure in communities receiving funds. 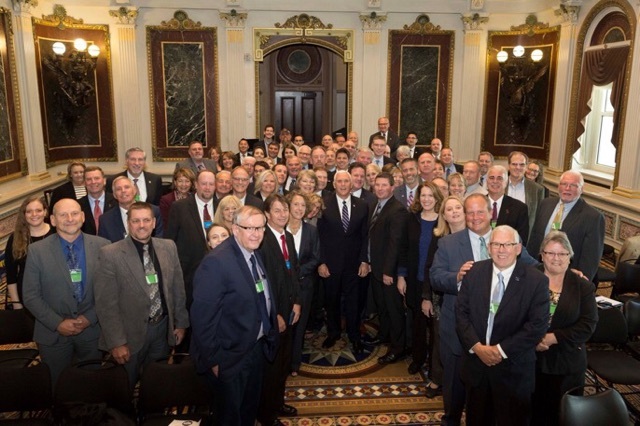 Indiana Commissioners were invited to Washington D.C. for the White House Briefing on October 25. Commissioners attended the briefing in the Eisenhower Executive Office Building (EEOB) along with a White House Tour. Barnes & Thornburg LLP hosted a reception after the White House conference for the county commissioners at their office in Washington D.C.